Broadly speaking, ‘09ers are a sundry lot with tastes that run the gamut from the staidly traditional to the modernistically whimsical. Add to that the fact that we, as individuals, insist on surrounding ourselves with unique, personally-appealing (and personally-reflective) things within our homes and offices and/or, even on our persons. But, finding a one-stop source for this admitted diversity can be a challenge. Fortunately, conveniently located at 518 Austin Highway where Terrell Hills abuts Alamo Heights, is just such an eclectic enterprise dedicated to serving, and satisfying, the discriminating (i.e. demanding) 09’er, no matter the preference or perspective and, it’s humorously telling (but not so PC) moniker is none other than 5 Broads Off Broadway. 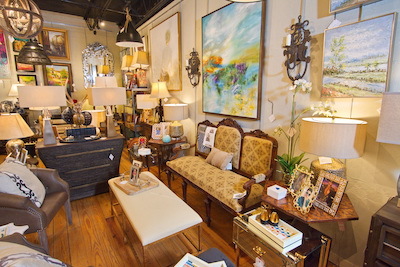 Aptly named for its original feminine founders and the emporium’s retail address, 5 Broads has been “the” place to go for décor pieces (and more) for the past 19 years. Constantly evolving in its exceptional offerings and ownership, FBOB’s philosophy has always remained steadfast in its commitment to feature fabulous finery, fancies, and just plain fun where interior furnishings are concerned. And, after almost two decades holding to that “broad view”, this off-Broadway production has definitely boomed. Currently, the only original “broad” remaining is long- term ‘09er, Debbie McCullough. 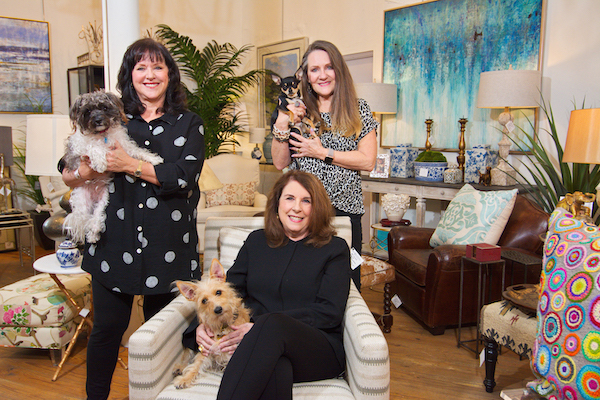 A natural and empathetic saleswoman, Debbie (a loving wife and mother of two) and a close gal-pal felt the urge to “go into business” after both of their youngest children headed off to college in 1999. Each was innately gifted where interior décor was involved and each loved to “shop, travel, buy and sell things,” all of which proved to be perfect attributes for retailing interior furnishings. Initially, the pair would go on scavenging trips purchasing things they deemed “desirable” then marketing their accumulated finds at various shows across the state. Soon, however, the constant travel grew wearisome and a permanent “close to home” location was sought. That was in 2000 and with three other neighborhood ladies joining the twosome, the newly minted 5 Broads Off Broadway, as a brick and mortar establishment located on the Austin Highway, came into being. Over the ensuing years, various “broads” came and went with Debbie remaining the constant. Today, she shares ownership and responsibility with two other talented ‘09ers, Kathy Scholl and Krys Turner. And, working together, the three have seamlessly continued the successful traditions established so many years before with, as Debbie asserts, “The intent to keep every visit to FBOB an exciting and surprising shopping experience.” And, thankfully for its many loyal patrons, that continues to be the norm. Upon entering, one can’t help but be impressed with the amount of quality and unique inventory arrayed throughout the store’s 3,800-square-foot interior gathered from across the United States and beyond. Seemingly, every inch abounds with hundreds of old, new and in-between highly-fashionable décor pieces. Antique, import, artisan and modern American examples comprise the inventory which ranges from large floor items including furniture (sofas, tables, chairs, etc.) to delicate objects d’art (statuary, figurines, decorative bowls, etc.) all representing a variety of cultural and esthetic roots. 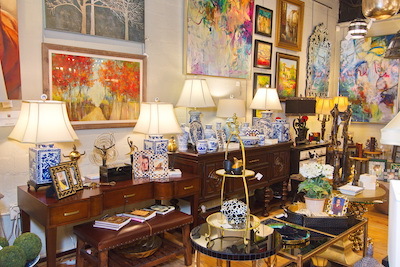 An expansive selection of purchasable lamps illuminates seemingly countless pillows, ceramics, mirrors, seasonal items, jewelry and much more all displayed attractively on and among the larger pieces. And, as an adjunct to the expansive inventory, a generous selection of complimenting upholstery lines are also available to customize and/or revitalize any selection. FBOB also enjoys a semi-exclusive retail arrangement with Lee Industries, popular manufacturers of exceptional furniture, as well as offerings from more than 100 other superlative brands. But, one-of-a-kind items abound as well. Basically, as visitors discover, within 5 Broads, there seems to be “almost everything” needed to visually (and joyfully) enhance any home or commercial environment and, as Debbie adds, “Decorators, professional and otherwise, love our policy of being able to take things out on approval or, in other words, trying before buying.” Now, how’s that for being broad-minded? In closing, delivery can be arranged on any purchase and, above all, customers can rest assured that after-the- sale satisfaction is paramount when dealing with 5 Broads Off Broadway. To ensure the same, Debbie and her charming staff (100 percent female) all bring a caring expertise in being able to advise and counsel regarding any selection (chosen for personal use or as a gift) maximizing a positive outcome when acquiring merchandise and, that’s one huge reason (along with the incredible inventory) for the enterprise’s much-deserved success – broadly speaking. Yep, FBOB (www.5broads.com) really does stand for fun, fancies and finery where furnishings are concerned and, for we ‘09ers, that’s just fabulous!